Dougal McNeill gave this talk as an introduction to one of the sessions at the ISO’s recent national conference / hui-a-tau, held in Auckland in December. This talk is of necessity arranged in a bitsy, fragmentary, tentative way. That’s because this is the kind of year we’ve had – there has been no single event or struggle defining union struggle. And our own position, in a very modest way, is changing. We’re bigger now, more experienced, and able to try some new things. Some old ways of working aren’t going to suit us so well anymore. I want to do four things: (1) outline the general state of union struggle; (2) look at what we’re calling ‘the political sphere’ and the unions; (3) think about how we talk about this, to ourselves and to our audience, and (4) end with some comments on what we need to be doing. Let’s start with the general state of the class struggle. The revolutionary left has been saying for a long time that the union movement is in a deep-seated, prolonged crisis. It’s important to stress for starter, however, that we are still here, and still amongst the biggest voluntary organisations in New Zealand: union membership was 371 613 at 1st March 2013. But unions have taken decades of hammering, severely weakening our power. It was realistic to talk about a General Strike to fight National’s Employment Contracts Act in 1991, and the CTU bureaucracy had to fight hard to make sure that didn’t happen. Come 2013, there weren’t even the forums where that slogan could have had any meaning. In March this year, union membership represented 16.6% of the total employed force, and a fifth of wage and salary earners. The total number has declined by 2% since March 2012, and the percentage coverage of the workforce has fallen steadily from 2008 to 2013. What are the results? We see them all around us – a pay gap with workers in Australia, casualisation, all sorts of routine humiliations in the workplace and, in forestry especially, deaths, as deregulated bosses don’t face the challenge of organised workers enforcing safety laws. 6 out of 10 employees, according to the December 2012 Household Labour Survey, are covered by individual agreements – the basic union job of collective bargaining is a minority’s preserve now. 30% of temporary workers are on no agreement at all. The situation amongst the poorest workers, the casualised, and those in the private sector is much worse again. Union density has managed to hold up much better in white-collar public-sectors areas, amongst professionals – teachers, nurses, public servants. In many ways now we’ve got two very different experiences of unionism – people like me, in the Tertiary Education Union, on collective agreements and with a real union culture in the workplace – and vast areas of the private sector un-organised, and in desperate need. So we need to rebuild. There are industries and job sites now where unions haven’t had a real presence in decades. In other industries traditions and values of solidarity have been weakened. The ongoing exodus of working-class families to Australia contributes to this. Rebuilding the union movement isn’t something that will happen when others do it. We’ve got to be a part of that. We’re rebuilding too. It’s not like these decades of setbacks have left our own ranks unaffected. I’m 32, not young by the historical experience of our movement, and have never once been on strike. I imagine that applies to a lot of us. The metaphor of the corner was too simple. 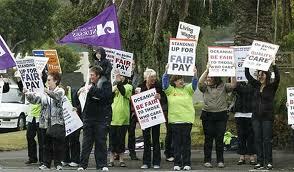 The aged-care, meat workers’ and wharfies’ struggles were “a false dawn.” They were defensive fights. The meat workers’ struggle especially was long, bitter, and draining, and resolved by intervention from without. Look at the big leap in person days ‘lost’ (lost to the capitalist class) in 2012 to 2011 – 78 589 from 10 stoppages compared to 4 850 from 12 stoppages. The meat workers and wharfies carried a lot of that – and draws, especially such hard fought ones, don’t encourage other workers to take action. On the government side, there are attacks, to be sure, but they’re either being carried out with a view to the future – as with the Employment Law Reform – or around the sides of industrial struggle, as with benefits. The government hasn’t gone hard-line in pay negotiations. They haven’t picked fights particularly. For both sides the centre of attention has moved to the political sphere. This political sphere is complicated, and contradictory. On the one hand it reflects our side’s weakness – workers do not have the confidence to strike out for themselves, and so look to other forces for guidance. But on the other hand it reflects, and in turn shapes, desires in the class. Cunliffe’s victory in Labour shows this – he’s tacked left to connect to workers’ discontent, but at the same time he’s been put forward as a ‘solution’, a saviour from on high delivering. The CTU’s political campaigning has produced important results. Helen Kelly has been a very prominent and campaigning CTU president over the past 2 – 3 years, much more confrontationally coming out as an advocate of workers’ rights – and much more directly promoting unions as fighting for workers’ rights – than either Ross Wilson or Ken Douglas did in their time. Kelly was the face of the union movement during the dispute with Peter Jackson, and copped a heap of misogynist and vicious abuse in the process. She’s written and spoken in many places on that dispute. She made herself the face of the meat-workers’ lockout, raising that campaign’s profile. The CTU – with Helen Kelly prominent – have been campaigning around deaths in the forestry industry, around the Living Wage, and over asset sales. The Living Wage and the issue of deaths in forestry have both been particularly successful – inequality and health and safety are now political questions in a way they weren’t a year ago. A big part of that is down to Helen Kelly’s advocacy. The union bureaucracy – the union leadership – see the same crisis that we do. Their membership and social weight is falling; these latest government attacks would severely limit yet again unions’ power and relevance. They don’t want that to happen, and are looking for ways to rebuild and re-establish unionism. The recent establishment of young unionists’ networks, social media organising, and political campaigns all need to be seen as part of that. This doesn’t mean that the disastrous politics of class collaboration have been overcome. Far from it. Disgracefully, “workplace productivity” is right next to “union education” on the CTU’s website as something members can learn about. As if increasing our own exploitation were what we built unions for! Or course we still need to argue, and organise for, class struggle unionism, for a politics that says don’t trust the bosses and rebuilds fighting class-conscious organisations. But there’s a danger these can become just timeless, abstract truths, slogans we repeat to ourselves outside of any context. 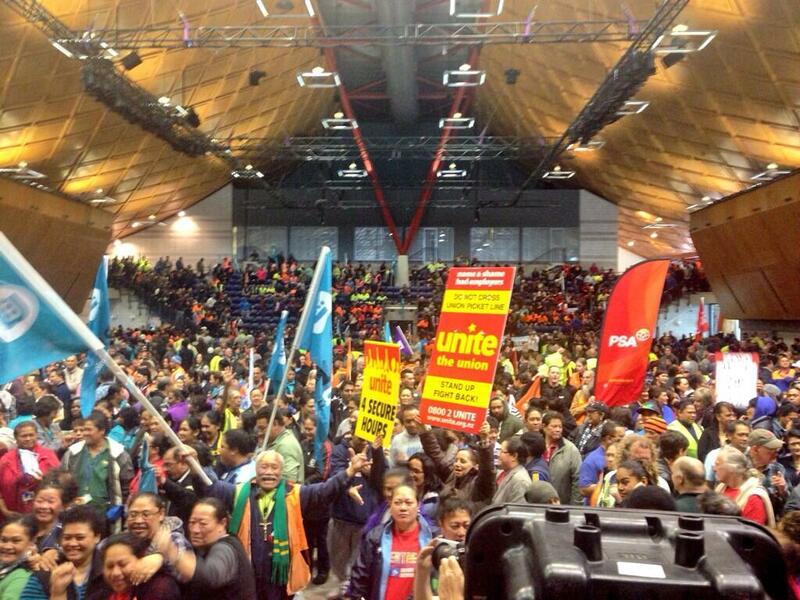 The CTU’s political campaigning reflects, and is shaped by, workers’ lack of confidence. There’s not the confidence – or the organisation – to use industrial action in forestry for health and safety. It’s not like there’s a militant rank-and-file movement being held back by the union leaders. In this context, campaigns like What Killed Ken Callow advance the cause of the class. 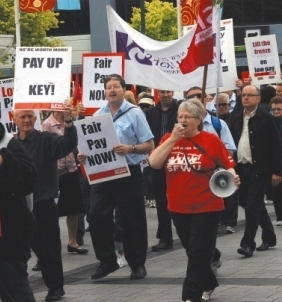 The Living Wage campaign is similar, as is the SFWU’s Equal Pay court case. These are organising – they involve public meetings, petitioning, putting pressure on employers, mobilising members – and they involve appeals to other forces, hopes, in the case of the Living Wage, that ‘good’ employers can be convinced. Currently, they reflect our weakness – it’s not clear that they need to reinforce this weakness. What might happen if a Council tries to back out of its Living Wage commitments, say? What kind of networks might form of union members at the meetings and presentations? We’ve missed a lot of the nuances so far, stressing the position of weakness without looking at the contradictory, potentially positive dimension. We have been sectarian towards the Living Wage campaign: our article on this campaign announced that it was ‘doomed to fail,’ just as the Warehouse signed up! We need to get better at reading, and involving ourselves in, union work in the political sphere. Where to from here? Helen Kelly gave a very interesting speech to the CTU Women’s Conference in Wellington this year. In it she outlines her strategy for the unions – delegates who were there spoke of it having a very positive reception. The speech is online, and is worth reading and thinking about. As unions we have two options about what we offer as do many social movement organisations. The first is the fly buys version of unionism. Join us because we are in your workplace and we will add value to the rate you get paid. The second option is that we offer a movement that people who share our values can participate in which is capable of effecting change in relation to those values and countering proposals which cut across those values. In the first version, we are replaceable and are simply meeting needs. We are selling value for money rather than values. People will join us when it is economically sensible for them to do so and not when it is not. People will respond as if they are buying a service rather than making a commitment and will act accordingly within the structures. In the second version people will be emotionally moved to be a part of what we stand for. They will want to be associated with the movement because they want to identify with the values and activities we promote. Members or not, they will listen to what we say and believe us. We will be a part of a wider social movement connecting up with others of like values who want to work together. We need these type of strong organisations in this country now more than ever. Fighting back is as much about the narrative we support as the action we take. The government is busy generating it – cutting benefits, removing work rights, cutting legal aid for the poorest defendants in the knowledge that no one cares. The list is endless but the story the same. Many traditional organisations are facing challenges to remain relevant in the current climate – churches, traditional political parties, clubs and groups and unions. But this is not how it has to be. Modern growing social movements have a number of common elements about them and we can look back to our past and to the present to see what they are – they are elements traditional organisations have lost to some extent over time. These elements include a low threshold for association, many paths to participation, no “created” barriers such as Members/non members and most importantly strong values propositions with actions consistent with those values. There’s some truth to this. But it also concedes that power on the job is gone for good. There was a barrier between members and non-members in the meat-workers’ lock-out – members were locked out of work and losing pay to fight for their rights and conditions together. Non-members were scabbing on this, looking out for themselves instead of the collective. There is no getting away from this, and nor should we want to. But we need to recognise, and be better at discussing, that fact that a debate on organising and rebuilding is happening at all, and that the CTU’s leader is using this kind of language. That’s a new situation. I want to end with some very brief comments on our own work. We’ve played a good role in supporting strikes and campaigns when they have come up. That’s part of our organisational DNA. What we need to get better at, though, is integrating union work into the weekly routine of our life as an organisation. It’s already a requirement of membership that you be a member of your trade union. I think we want now to be talking more about what people can be doing in their unions. This will often be very small steps, considering the state of the movement. Are you putting up posters for the union, if you’re in a workplace where you can do that? Are you going on any training days that are available? Are there any meetings you could be attending? These are small gestures, sure, but they matter. We want to be amongst the people doing the most to build (and re-build) our unions on the job. In a period like this one a lot of that work involves small, patient, detailed work. These little things matter because they give our work concreteness – there’s no point producing abstract propaganda about the new for class-struggle unionism if we’re not ourselves building unions. They matter, perhaps more importantly too, because these kinds of regular contacts with our unions keep us in the political world of the class. There are all sorts of pressures, especially in a campus-based group like ours, away from politics – either into ‘activist bubbles’ or social-media circles of like-minded people or whatever. Regular, political contact with other workers in unions trains us in getting a sense of how politics is going in the class. We should have discussions of the unions, and of our union work, a regular feature of branch meetings. Can you ask your branch for advice about a meeting that’s coming up? Are you thinking about how to recruit people to the union? We know there are going to be battles to come. It’s not a case of if but when. Either the government – or a rogue employer – will push too hard and provoke a response, or a group of workers, we don’t know which ones, will come out into struggle. The more we can be a part of the living struggle as it is now, the better we’ll be placed to argue for what we know it needs to become.